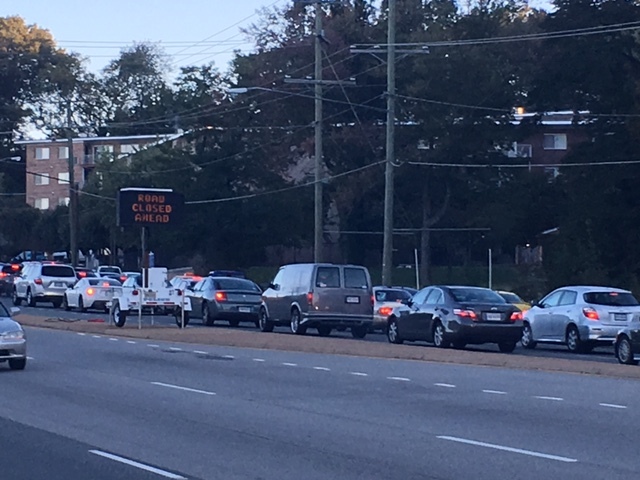 Residents turned out in Fairfax County to tell transportation planners it's time they received money for road improvements. One said, "My parents were promised these improvements back in the '50s and '60s." ALEXANDRIA, Va. — From Arlington and Fairfax to Loudoun and Prince William counties the wish list is long for transportation improvements. But there isn’t enough money to pay for it all. A crowd turned out in the Mount Vernon section of Fairfax County Wednesday night to tell regional transportation planners it’s time they get what Tysons Corner, the Dulles Corridor and other northern Virginia transportation hot spots are getting — money for road improvements. “In eastern Fairfax County, the No. 1 priority is investing and widening Route 1 (Richmond Highway) and adding bus rapid transit,” said State Senator Scott Surovell, a Democrat who represents parts of Fairfax, Prince Wiliam and Stafford counties. “We also have the underpass on Route 1, right where you get off I-95 … it’s very dangerous … the road needs to be widened,” he said. A representative of the Northern Virginia Transportation Authority told the audience that the regional body has a list of 60 proposed transportation projects, ranging from bike trails to roadway improvements, which would cost about $2.5 billion. But the group estimates its available funding at just $1.285 billion. “We’ve waited much too long for these improvements. My parents were promised these improvements back in the ’50s and ’60s,” said Peter Sitnik of the Mount Vernon Council of Citizens Associations, arguing for the widening of Richmond Highway and road improvements at the underpass near Lorton. “The underpass itself is too low, trucks get stuck there; and when it rains it, floods,” Sitnik added. Other projects vying for regional dollars are Arlington County’s ART Operations and Maintenance Facility, widening the Route 15 Bypass in Loudoun County and improvements to the Route 28 Corridor in Prince William County. The Northern Virginia Transportation Authority has scheduled an open house and a public hearing at 7 p.m. Thursday, May 10, where residents may offer their comments on the 60 proposed projects. The regional transportation planners expect to decide in June which of the projects it will undertake over the next six years.